Originally designed as model orthodontic storage boxes we now sell these for many products. 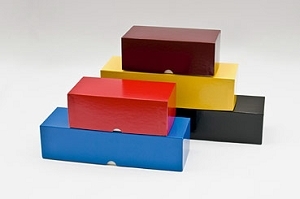 Our two piece rigid set up boxes are available in 29 beautiful and vibrant colors. Each of these set up gift boxes have a white paper wrapped base with a colored paper wrapped top. Made from sturdy and durable .034 chipboard these boxes are idea for storing products as well as adding more dazzle to any gift product. Don't forget, we can also custom emboss and custom print. Call us to discuss your needs.